​Drawing (aka Introduction to Drawing) is a foundation course recommended for all students interested in art. Students will investigate a variety of drawing techniques and materials using both observation and imagination. Students will practice artistic behaviors in combination with studies of Elements and Principles of Design, art history and aesthetics to broaden a sense of the context in which artists work. This course is a prerequisite for Painting and 3-D Design, and may be used as the prerequisite for Ceramics I. There is no prerequisite for this course. This course satisfies the ½ credit art graduation requirement. ﻿In week one, students will become familiar with course objectives, classroom facilities and teacher expectations. ​We will begin the study the line and investigate its power to create imagery. Students will begin to work in different styles of line including CONTOUR LINE and CONTINUOUS CONTOUR LINE. Contour Line Drawing is a type of drawing in which all visible edges are recorded; this includes physical edges as well as edges created by shadows, highlights, color changes, etc. Here's a video I made demonstrating the technique of contour line drawing. ​Would be much better with a split screen, but c'est la vie. Line has a lot of power. It can create a likeness, lead the viewer's attention, and define a space. This week, we will learn and practice line techniques to create a sense of mass. We will complete our study of Contour Line drawing, introduce Scribble Line drawing, and finish the week with Cross-Contour drawing. Scribble Line drawing is a method of drawing where line is used in every way EXCEPT as an outline. Scribble lines can be used to create a modeled (shaded to look three-dimensional) effect and to give an impression of movement and texture. The drawings capture a sense of frantic energy and are both exciting to create and exciting to view. To be successful at Scribble Line Drawing, the artist must divorce himself from the idea of outline and use line to fill space with VALUE (lightness or darkness). Lighter areas are created by going over the paper only a few times or not at all. Darker value areas are accomplished by going over them with line again and again. Cross-Contour drawing is a line-drawing technique that artists use to understand the three-dimensions and mass of an object. A good beginning step to understanding Cross-Contour is to think of it as a drawing that shows the three-dimensional features of an object in a way similar to the way a topographical map shows the features of the land. The curves of what appear to be parallel lines give us cues to the up-and-down undulations of the three-dimensional surface of the subject. Here's artist Vince Low creating one of his celebrity scribble drawings. Great video lesson by Phil Davies of arttutor.com on how to understand and make cross-contour line drawings. What is VALUE and how do we use it? This week we will begin our investigation of VALUE, an exciting design element. VALUE refers to something's relative brightness or darkness and it is through bringing value into our work that we can create a sense of mass and three-dimensions. Also, the mystery of the Number 2 pencil will be revealed! Here's a clear, easy breakdown on the method of drawing a 9-step value scale from thedrawingsource.com. It takes all of the mystery out of getting the right grays. ​of our new topic, VALUE. SHADING LESSONS- Artist Leonardo Pereznieto gives a great lesson on turning flat line drawings into drawings that suggest 3-D forms. ​PLUS he has a really cool Italian accent. DRAWING GEEK: Learn About Pencils! ﻿And how do I describe this? ​Well, let's just say that I love pencils. A lot. Here's an entire page devoted to that with some great links to pencil stuff. And we continue with our study of VALUE! Drawing in value to create a sense of a subject's mass is one of the artist's great challenges. It requires good pencil control, a knowledge of pencils and other artist's tools, an understanding of how light plays over a three-dimensional surface, and excellent observation. This week, we will study and practice the knowledge and skills necessary to have success in value drawing to create the three dimensional illusion. We will draw all sorts of forms, but the sphere is the hardest, so our web resources will focus on that. Click on the button below for the Shaded Sphere handout. Here is a handout of the above illustration the demonstrates the shadows and highlights as they appear with a single light source as well as provides key vocabulary for the final exam. Here is an excellent YouTube video by Wei Ho, a film and videogame concept artist. His website, The Art of Wei, is an excellent resource for drawing tips and lessons. 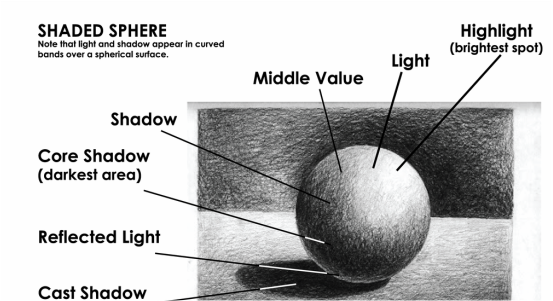 Here's a great resource for learning how to create believable cast shadows from artist Bill Martin's (no relation) Guide To Drawing. what is proportion and how is it used? Simply put, PROPORTION is the size of one thing compared to the size of another. Being able to convey accurate proportions in your life drawings will make them seem much more realistic. Manipulating proportions to achieve effect will make your imaginative drawings more interesting. This week we will learn various techniques to check and measure proportions as we draw. we will learn about and use LINEAR PERSPECTIVE, a system of drawing that uses lines and points to create a consistent, believable 3-D illusion. In class, we will study both 1-point perspective and 2-point perspective. We will pursue our study with several practice drawings and culminate with a week-long drawing in 1-point perspective of the hallway outside the art room. This drawing is worth 100 project points. Here's one of my diagrams on how to use the pencil as a measuring tool. This one shows what it should look like when you are looking down your arm to the pencil and the subject. Here's the other of my diagrams on how to use the pencil as a measuring tool. This one showing an overhead view how you should hold the pencil relative to your body. Click above for a video on how to set up your drawing board before you begin your LINEAR PERSPECTIVE drawing. Here's a YouTube video in which I demonstrate the technique of measuring for proportional accuracy. A FIGURE DRAWING is a drawing of the human body. The human form is one of the great themes in the visual arts. We will learn how to apply all of our techniques learned to date to capture the dynamism (changing nature) of the human body through our drawings. During the FIGURE DRAWING unit, we will use CHARCOAL for many of the drawings. CHARCOAL is a natural artist's material that is created by the slow combustion of wood. It is a very loose medium (artist's material) that allows for smudging, blending, and expressive lines. We will begin with GESTURE DRAWING, a way of drawing used to quickly capture the sense of a subject's living pose. We will also make use of our prior studies in proportion measurement and value by applying them to drawing the human form. All of these ideas will come into play as we begin our all too brief study of drawing the human figure. Special thanks has to be given to our friend Kirilee from kirilee.deviantart.com who allowed me to use part of her great series of "Drawing Reference" photos in this lesson. If you click on the "8 Figure Drawing Tips" presentation below, it will also take you to a gallery of 10 poses by Kirilee. If you visit her site and search "Drawing Reference" in her gallery, you can see MANY more poses in this set. Professor Chris Warner of the OTIS College of Art and Design does a wonderful video lesson on how to do an extended-time gesture drawing. ﻿idrawdigital.com page on drawing the human proportions with a nice clickable chart that shows average proportions based upon gender and age. 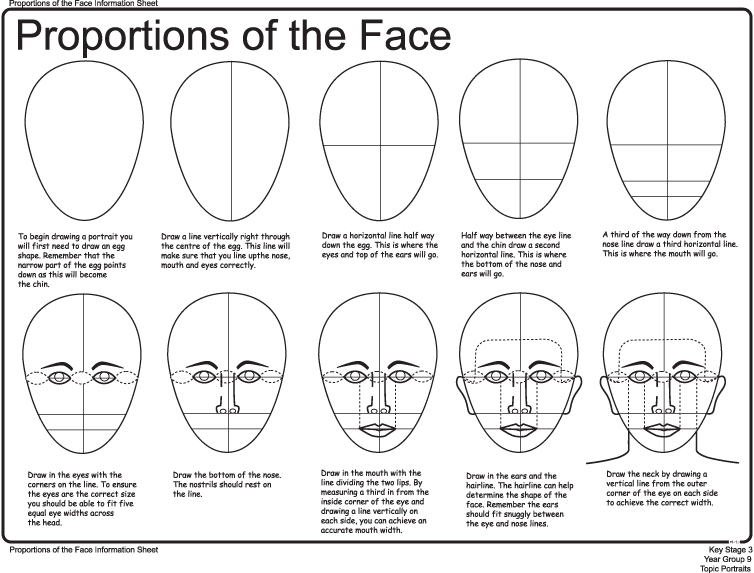 Here's a very convenient handout from Clark County School District's (Nevada) art department that diagrams the basic proportions of the human face. Click above for a slide show of figure drawing tips. Artwork is said to be NARRATIVE when it incorporates elements that tell or suggest some sort of story. In this project, you will attempt to bring narrative qualities into your work while utilizing nearly all of the techniques we've studied to date. While developing your idea, we will study some works by the Surrealists, an early-to-mid 20th Century movement in art, writing, and music that examined the unconscious mind. Surrealistic artwork is extremely narrative, but not in a conventional way! Click above for a quick, well-explained tip on how to compose, or set up your drawing. CLICK HERE: Who Were The Surrealists? 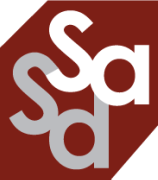 Click above to go to jump to theartstory.com's great introduction to the Surrealists! Click here to jump to the creativebloq.com's useful article, "How To Use The Rule Of Thirds In Art."